Absolutely no business will be conducted on Shabbat or holidays. Take I-495 (Washington Beltway) to I-270 North toward Frederick. Take Exit 6B – Route 28 West toward Darnestown & move into the left lane. At the 4th traffic light, turn left onto Darnestown Road. Continue past 4 more traffic lights and at the 5th, turn left onto Travilah Road. 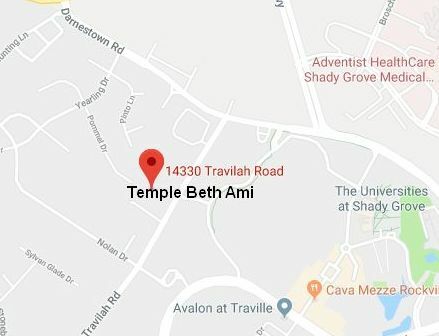 Temple Beth Ami is the second driveway on the right, 14330 Travilah Road. Take I-270 South toward Washington. Take Exit 8 – Shady Grove Road. At the end of the exit ramp, turn right at the traffic light onto Shady Grove Road. Continue to the 4th traffic light and turn right onto Darnestown Road. Turn left at the 3d traffic light onto Travilah Road. Use the Metro Red Line and exit at the Rockville station (not Shady Grove). Take Ride-On bus 56 towards Lakeforest Mall. Get off at the intersection of Darnestown and Travilah Roads. Walk down Travilah Road for about .25 miles. Please visit the Metro website for further instructions.